NEW YORK, New York, October 30, 2012 (ENS) – “Sadly, this storm claimed the lives of people throughout the region, including at least 10 in our city – and tragically we expect that number to go up as information continues to come in,” said New York Mayor Michael Bloomberg surveying his damaged city this morning in the aftermath of Hurricane Sandy. The devastating superstorm made landfall just south of Atlantic City, New Jersey at 8 pm Monday, flooding low-lying areas of the New Jersey and New York, including areas inhabited by roughly 375,000 people, evacuated ahead of the storm. The death toll across the United States rose to 33, with many of the victims killed by falling trees. 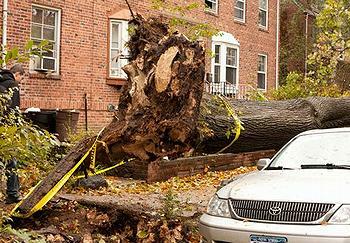 Falling trees also downed power lines and crushed homes and cars throughout the New Jersey-New York area. “Trees are down everywhere – 100 foot tall trees were uprooted like it was nothing, sidewalks ripped apart, it was ridiculous,” Queens resident David Dorrlamm, told ENS. The storm caused some 23 serious fires to parts of Staten Island, Brooklyn, Queens, as well as City Island and the Bronx. The most recent report has approximately three-quarters of a million New Yorkers without power. There are something like 326 buildings in 59 public housing developments without power. That’s about 60,000 people in more than 26,000 apartments, said Mayor Bloomberg. “The steam system in Manhattan south of 42nd Street was shut down as a preventive step by Con Ed. That affects heating, air conditioning, ventilation systems, including many of our hospitals. Because they shut it down preemptively, we’re hopeful that the steam system can be restored fairly soon,” Bloomberg said. All major airports serving the New York-New Jersey metro area are closed today. Runways are flooded and there are no flights leaving or arriving. New York public schools are closed today and tomorrow, but Mayor Bloomberg has asked city workers to come to work if they can do so safely. “As to City employees, here’s what we’ve told them: New Yorkers need your help today. Working for the City, we have an obligation to help others. If your office is open and if you can safely – and I repeat safely – get to work, please do so. If your office is closed and you can safely report to a shelter to assist with operations, please do so,” the mayor said. Now considered a Post-Tropical Cyclone, Sandy is moving slowly west northwest over Pennsylvania, western New York and will blow north into Canada on Wednesday. Forecasters say the storm will weaken steadily over the next 48 hours, but high winds, including gale force winds, are still expected over coastal waters of the Mid-Atlantic States, New York and New England. Rainfalls have amounted to 3-6 inches in North Carolina and 4-8 inches in the Mid-Atlantic states with isolated amounts of more than 12 inches. Conditions in the New York-New Jersey area are slowly improving. Most bridges are still closed or open to emergency personnel only, except for the Tappahn Zee Bridge to upstate New York. All MTA subway, bus and commuter railroad service is still shut down. Two tug boats collided with the North Jersey Coast Line’s Raritan River Draw Bridge at approximately 4:15 am this morning. In addition, three boats and two cargo containers collided with the North Jersey Coast Line’s Morgan Drawbridge over the Cheesequake Creek at 4:40 am this morning. Two boats are also currently resting atop this bridge. The full impact to these bridges is unknown at this time. Washouts have been reported along the North Jersey Coast Line, as well as at Kearny Junction, a critical link for MidTown Direct service to New York City. 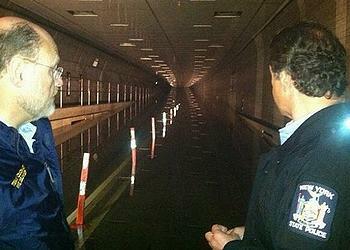 Flooding has been recorded in Newark Light Rail tunnels while debris has impacted power lines along the Hudson Bergen Light Rail. New Jersey Transit rail station hubs at Hoboken, Secaucus and Newark Penn Station sustained impacts due to flood waters.